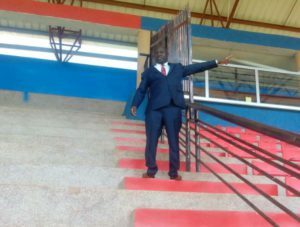 Lawrence Mulindwa shows journalists the part of the stadium that was vandalised. Photo by Shaban Lubega. FOOTBALL–Following incidents that happened at Kitende during Vipers’ 1-0 victory over SC Villa, which saw the latter’s rowdy fans destroy St. Mary’s Stadium property, Vipers SC club president has come out to comment on the unbecoming acts. Speaking at the media press conference held Monday at the St. Mary’s Stadium, Vipers’ patron Lawrence Mulindwa, said: “We are trying our level best to bring sanity into the Ugandan Football. “I am happy that the fans have come back to the Stadium. We may not be able to bring back the fans that filled the Stadium during the early 80s now, but I’m sure that there is a steady progress. “Sponsors have now come back but as you know very well that they want to associate with a Club where there is sanity. The game which was played at a 20,000 capacity state-of-the-art St. Mary’s Stadium at Kitende, went on well until the Vipers goal by Tom Masiko in the 30th minute. Violence as was previously anticipated erupted from a section of the Villa fans, who accused referee Alex Muhabi of denying them a penalty. More violence broke off as Police failed to control the rowdy Villa fans who threw urine bottles towards the VIP sections, with some sending vulgar comments to Club Patron Mulindwa. Futher commenting during the press briefing, Mulindwa condemed the actions of the SC Villa fans. “They used obscene words in front of our children and poured urine onto the VIP section. Mulindwa went on to condemn the acts of hooliganism and warned other clubs who are yet to visit Vipers this season to be cautious with their fans. Much as many believe that the hooliganism acts broke off due to the poor officiation by Muhabi, Mulindwa put it on record that Villa fans had planned these acts before the encounter on Saturday. “We gave them a side that our fans needed the most and it was big enough for them, but their purpose was to put off the roof and burn down my Stadium and whoever was there. You saw as they went to the extent of removing the toilet papers from the areas of conveniences,” continued Mulindwa. “What Villa is doing is now beyond hooliganism, they attacked the referees in Masaka against KCCA FC which is on record and FUFA is aware and up to now nothing has been done. They were singing those vulgar songs before the game from the time they entered, they had planned it at Villa Park, and they wanted to refuse the Entrance fee of 10,000. The Club Patron said that he is waiting for what the Football governing body is going to do to Villa, but Vipers as a club is going to handle individual fans. “I’m going to deal with individual fans and not Villa as a club. Mukwasi of Nsambya, Lutaaya of Kisenyi, Tito of Nateete and Miracle are some of the Villa fans on my Radar. They are scaring away our would be supporters and it was a TV game, so the whole of Africa was watching,” he said. The water system was destroyed. The gate was also dismantled, and, according to Mulindwa, it is not made by “ordinary materials”. They also wanted to destroy our Public Address System, he said. The former FUFA president also hinted that he is to install CCTV Cameras come their next home league game.